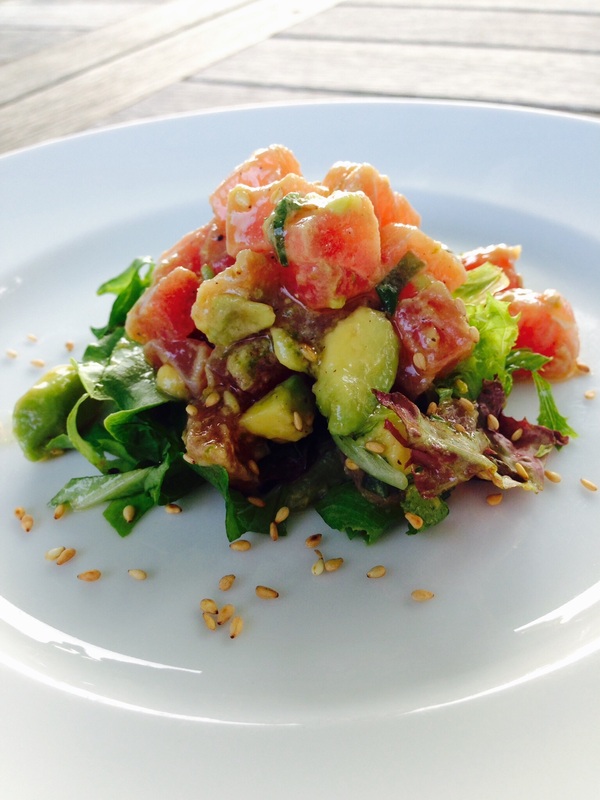 The key to great tuna tartare is super fresh tuna. And although I get it practically off-the-boat fresh here in RI from the folks at The Local Catch, a group that sells only fresh, local and sustainable seafood, I still freeze my tuna before using it. It’s easier to cut tuna cleanly into cubes when it’s still a bit frozen. Chop the tuna into 1/4″ cubes or smaller. Place in a large bowl and keep in the fridge. In another bowl, combine the olive oil, lime zest and juice, wasabi powder, soy sauce, hot pepper sauce, salt and pepper, and scallions. Pour this over the tuna and mix gently. Add the chopped avocado to the bowl and mix gently. Let it sit in the fridge for at least an hour for the flavors to combine. Before serving, take the bowl out of the fridge and let it warm just slightly. Taste for seasoning. Top with sesame seeds. Serve on crackers or over fresh greens.